The 3-phase synchronous Linear Servomotors from the AL2000 range have both a coil unit and a magnet plate. The coil unit contains a grooved, laminated core with inlaid copper windings. It is generally used as the moving part. The magnet plate contains the steel plate to which the permanent magnets are fixed. The AL2000 series consists of eight different motors, all having exactly the same width of 80 mm (incl. magnetic assembly). This means that all the motors can be operated using the same magnet plates. They can be combined in any desired way. The magnet plates are fully sealed and therefore have an almost perfectly level and robust surface. The coil units are also potted, satisfy protection class IP 64, and are therefore suitable for use in aggressive environments. Coil units are fitted with a 0.5 m cable bundle and optionally with pre-assembled connectors, so that they can be quickly connected to the connector box or the servo drive via plugged connections. This greatly reduces the difficulty of implementing the cabling and makes a significant contribution to avoiding errors. 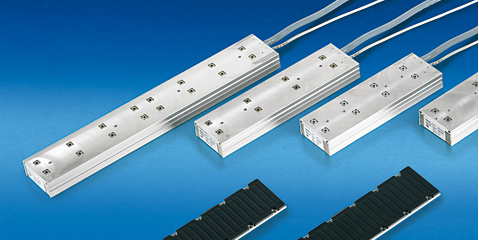 In combination with the Servo Drives AX2xxx or AX5000, the AL2xxx series linear motors are particularly suitable for dynamic movements where high acceleration is required over short distances. Operation with the AX2xxx/AX5000 is made extremely simple through default values. The MES system registers the magnetic field of the permanent magnets of the magnet plate. It sends, with the aid of built-in electronics, encoder signals for commutation as well as speed and position control to the AX2xxx/AX5000 series Servo Drive. The MES provides one sine wave per 24 mm pole pitch and a precision of 1/10 mm. As a further accessory, Beckhoff offers an adapter box with motor, feedback and thermal protection line connected on one side. The pre-assembled motor and encoder lines can be attached on the other side.